Available at the bottom of this page! The original deck features a patented anti-floating system s. S: Inflatable air chambers on the lateral ends prevent flutter at high speeds. Made with 3 thicknesses, guaranteed sealing with thermal protection. Waterproof exterior in heavy polyamide and welded seams. Saddle cover stowed in the chest pocket. 100% waterproof inner membrane - lined interior. Metal eyelets for anti-theft lock on models without screws. All our aprons are delivered in a tucano urbano cover. The deadlines can vary 5 to 15 working days, contact us before the purchase. Non contractual photo, example of illustration !! new parts in their packaging. 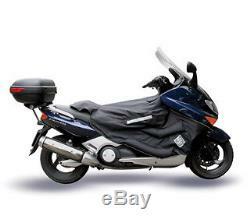 Yamaha 500 tmax 2004> 2007 (5vu). The tucano urbano aprons are the best way to get maximum protection against cold and bad weather on a scooter. They are specially designed for each model of scooter (here for the kymco agility plus) and are equipped with the inflation system. S, inflating system by lateral air chambers intended to stiffen the deck and prevent flutter, turbulence and. Sounds for the driver at high speeds. The tucano urbano aprons are easy to install and come in a cover with instructions for assembly. The installation is done through a system of straps and resumes the original screw fasteners when necessary. There are no holes to be made with tucano urbano aprons. A lot of them are equipped with one. To hang it with your lock .. Finally, an apron reference can be compatible with several scooters, so the data sheets do not contain all the pictures of the different models of scooters, only a few for information. The processing time of your order can vary 4 to 15 working days, contact us before the purchase !! choose the delivery method before paying! Important: in case of choice of global relay !! specified in your order your choice of relay point or contact us at 03.25.55.74.71. Relay point only in f. Continental rance not the islands, like Corsican etc .. other thousands of coins with misterbike-fr. Anti-theft, batteries, spark plugs, chain kits, pinions, crowns, chains, clutch discs, air filters,, oil filters, fuel filters, oils, engine gaskets, spinnaker gaskets, brake levers and clutch grips, grip pads, jaws brake, fixed and floating brake discs, brake pads, motorcycle tires, cross and enduro tires, scooter tires, quad tires, inner tubes, lamps and spotlights, wheel bearings and steering bearings, spraychain, turn signals, mirrors, fork tubes, cables, tank caps, handlebars, saddles, bolts, handlebars, valves and stoppers, contactors, workshop saddles, footrests, belts, exhausts, tools, top cases and windshields. 06.62.69.50.19. The item "apron winter protection scooter tucano r033 yamaha 500 tmax t max 2001/2007" goes on sale since Wednesday, January 30, 2013. It is in the category "auto, motorcycle parts, accessories \ motorcycle parts \ other". The seller is "misterbike-fr" and is located in / at bettancourt la ferée. This item can be delivered anywhere in the world.